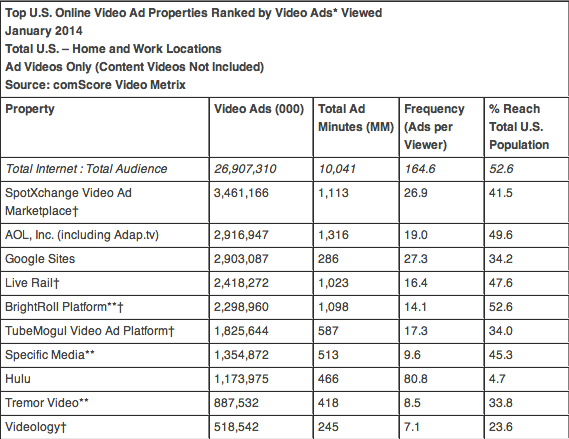 ComScore have released their video ad statistics for January. It seems during the December festive period, video ad views were at an all time high. In January however, total views have settled to just above what they were pre Christmas advertising, with video ad views in January totaling 26.9 billion, still showing a slight increase of one hundred million views when compared to November’s 26.8 billion. This is the third month in a row that BrightRoll have not been in the Top 3 video ad property sites. Overall, 85.1% of the US online audience viewed a video. Video ads accounted for 35.6% of all videos viewed. 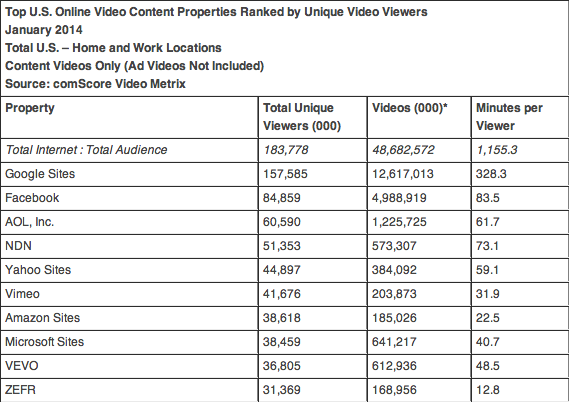 The Top U.S. Online Video Content Properties table has stayed the same, with Google leading the chart for unique video viewers. The Top U.S. Online Video Ad Properties Ranked by Video Ads Viewed has seen major changes with SpotXchange taking over the top spot, AOL dropping into second, Google staying in third and LiveRail slipping to the fourth spot.